On Thursday 23rd of June 2016 the people of Britain voted to LEAVE the European Union surprising all including politicians, financial markets, big businesses, pollsters, bookmakers and even prominent LEAVE campaigners such as Nigel Farage who conceded defeat shortly after the polls closed at 10pm only to start backtracking a couple of hours later. The apparent surprise result that confounded most expectations has led to a spike in market and policy uncertainty as within hours of the decision David Cameron announced that he would be stepping down as PM and thus triggering a Tory leadership contest. Whilst Labour apparently went one step further by completely self destructing as 75% of Westminister Labour MP's attempt to eject Jeremy Corbyn, a civil war that looks set to destroy the Labour party. So Britain today remains rudderless without a functioning government or opposition let alone any idea of exactly how a BrExit vote will translate into real world impacts in every day peoples lives where now major business and economic decisions have been put on hold. But first a quick recap of what actually happened on BrExit night that caught virtually ALL by surprise in this video of my selection of the highlights from 8 hours of BBC coverage of the EU Referendum result. 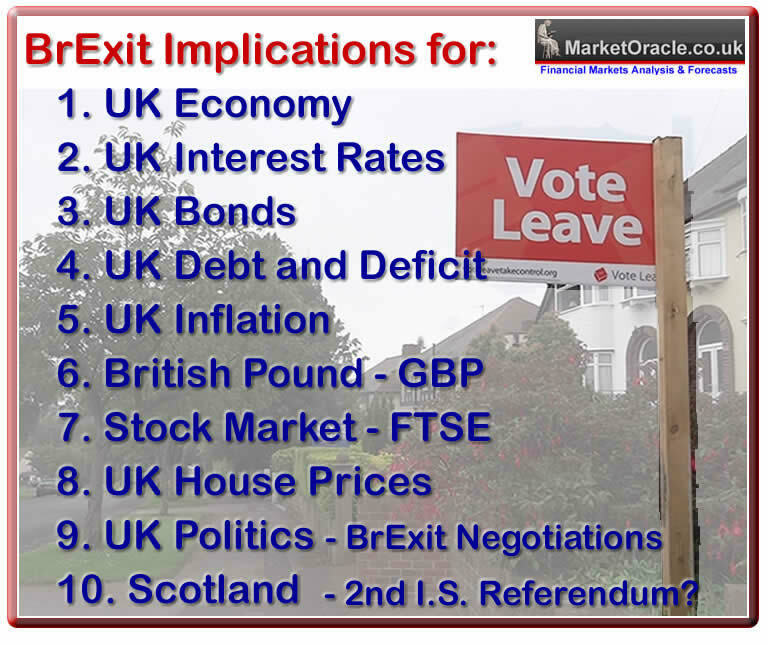 And this trading markets video illustrates how all hell broke lose once the polls closed Thursday 23rd June as the markets, bookmakers and pollsters ALL got the EU Referendum very badly wrong following YouGov's 10pm poll that had convinced all, even Nigel Farage that REMAIN had won triggering a further sharp rally in sterling and FTSE futures that was sustained until the actual results started to be announced shortly after midnight. The UK economy WILL take a hit as I have often warned to expect a loss of GDP of between 2% and 4% over the next 2 to 3 years depending on Europe's stance taken during the BrExit negotiations, where the early voices from the likes of Juncker are very threatening demanding that the UK immediately starts the process for leaving the EU by means of triggering Article 50. However, I think things will calm down and Europe will become more amicable than today's rhetoric because europe is structurally and symmetrically very weak that Brexit has just weakened further. So in terms of GDP the hit will probably turn out to be closer to 2% then 4% as more sensible heads start to prevail. The REMAIN camps 'Operation Fear' had Osborne's announcing an emergency Brexit tax hike and spending cuts budget which has apparently now evaporated. Instead expect Osborne ( for as long as he remains chancellor) to announce the exact opposite i.e. a stimulus budget, probably pumping an extra £30-£50 billion into the UK economy that I am sure will please the stock market some more. With Osbornes latest utterance that he intends on cutting in Corporation Tax from 20% to 15% which would compare against 30% in Germany and 39% in the US. The Bank of England prior to the BrExit vote warned of a technical recession. Now post brexit the BoE is bending over backwards to support the UK economy through monetary stimulus. However also warning that it may not be enough to overcome economic weakness. "The question is not whether the UK will adjust but rather how quickly and how well,"
In terms of the Banks view on the level of UK economic uncertainty i.e. how the economy will perform against forecast expectations, then as the following chart demonstrates that BrExit is currently being perceived as generating economic uncertainty of nowhere near that of Lehman brothers, the euro-zone crisis or the ERM crisis of 1992. Instead in terms of economic uncertainty ranks along the lines of the LTCM crisis and the Bush and Blair invasion of Iraq. However, when considering UK economic policy uncertainty i.e. market perception of the uncertainty of future government or central bank economic policies on the basis of which to make investment decisions upon, i.e. such as uncertainty created around the consequences of negative interest rates. So it should not come as much surprise that in terms of economic policy uncertainty of what the Government or Bank of England will do going forward as the UK withdraws from the European Union, has resulted in an economic policy uncertainty spike which lends itself to greater market volatility as we have been witnessing this year and thus likely to continue going forward. In terms of the outlook for the UK economy then expect the Treasury, OBR and Bank of England to once more downgrade the prospects for UK growth this year. With early economic voices coalescing around UK GDP of just 1% for 2016 and probable recession for 2017 with these reports to materialise over the coming months. And the OBR was expected to publish its next report this month (July) but apparently that has now been cancelled which now won't appear until November or December. So in terms of the costs of Brexit to the UK economy and taking account of the forecast range of 2% to 4% GDP over the next couple of years, then post Brexit my conclusion is that the hit is probably going to be nearer to 2% then 4%, so the UK is approximately going to take a 2.6% GDP hit. Whilst my forecast of February 2016 had factored in a hit of between 1.6% and 2.1%. However, the outcome for 2016 will likely turn out to be bang on my forecast of 1.6% GDP. Therefore the real hit of Brexit will be felt in 2017 where instead of my forecast growth of 1% to 1.6%, the UK economy could flat line at probably around 0.5% growth! And that is how I expect the 2.6% cost of Brexit to manifest itself. So as I have repeatedly warned, FREEDOM does carry a price and that price now looks set to be approx 2.6% of GDP which is set against my pre-brexit expectations for a 1.6% to 2.1% cost. So whilst it will be painful, however it won't be as bad as ANY of the recessions of the past 40 years! AND DON'T FORGET that the economic IMPACT of BREXIT will be GREATER on the EU than on the UK! Whilst official UK CPI Inflation continues to hug near 0% at a rate of just 0.3% for May 2016, meanwhile RPI which is the closest official measure to real inflation has continued to nudge higher to 1.4%, which are set against the demand adjusted Real UK inflation rate of 1.8%. So deflation? Not really, real UK price Inflation is actually well above 1% and was already trending towards 2% before BrExit. So what are the future prospects for UK inflation following BrExit? Firstly ,there has been the sharp depreciation in sterling of about 12% which instantly increases the price of imports and therefore should be having an immediate effect on inflation. However, unless the slide in sterling continues then this inflation should prove temporary and start to come out of the inflation indices a year from now. Secondly there are the longer terms consequences of increased deficit spending stimulus for the UK economy as George Osborne abandons his economic policy of working towards a a budget surplus by 2020 but instead looks set to go on an economy boosting deficit spending spree. Therefore both of these factors look set to drive UK CPI inflation significantly higher to above CPI 2% and very probably to spike above 3% early 2017, and RPI probably spiking above 4%. However, beyond that unless the surge in inflation triggers significant wage inflation then CPI inflation should then soon start retreat to back below 2% and the trend towards that of the inflation rate of the US at that time a year from now. So the bottom line is that despite brexit inducing economic weakness, expect UK CPI Inflation to spike towards 3% and RPI to above 4% by early 2017, probably peaking for January 2017 data before trending lower into mid 2017. Now before you all start panicking you need to realise that in effect nothing has really changed where inflation is concerned for we remain firmly immersed in an exponential inflation mega-trend of which the rise to 4% RPI would just mark the continuation of, where even the great deflation of the great recession of 2008 to 2009 is a mere blip on a long-term inflation trend. For those who think that the sharp rise in inflation could trigger a rise in interest rates, then I would like to remind you all that inflation of above 5% of just a few years ago failed to prompt a Bank of England to raise rates due to the bank being terrified that its banking sector brethren would go bust again like 2008. So no rate hikes despite the rise in inflation which means savers are about to get screwed as savings rates FALL whilst inflation RISES. 6. British Pound - BrExit Wins Britain Currency War! 7. BrExit Stock Market Upwards Crash as FTSE Recovers Friday Plunge and More! And ensure you are subscribed to my always free newsletter for ongoing in-depth analysis and forecasts. Your Independence Day Analyst who expects over time more and more people will come to realise that Britain really did make the RIGHT decision to LEAVE the EU.